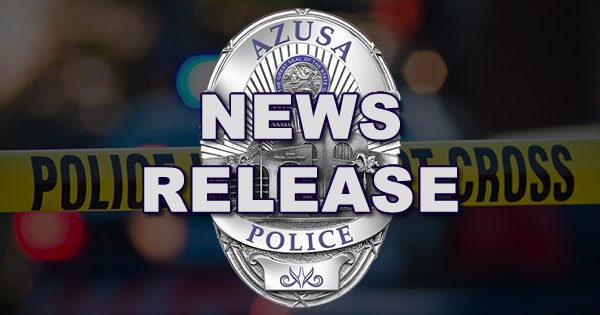 On November 6, 2018 at approximately 1622 hours, Azusa Police Department Patrol Officers were dispatched to the Shell gas station located at 106 S. Azusa Avenue, Azusa regarding a male adult armed with a handgun inside the location. Officers arrived to the scene as the armed suspect was attempting to flee the location. The suspect was immediately confronted by several AZPD Officers as he exited the store. The suspect quickly discarded his handgun and immediately surrendered. The suspect was then taken into custody without further incident and the loaded .357 Magnum Revolver was recovered adjacent to him. During the preliminary investigation, it was revealed that the suspect had just kidnapped an adult male at gunpoint. The suspect demanded the victim to drive him to the Metro Gold Line train station in the 800 block of north Azusa Ave., Azusa. Fearing the suspect was going to shoot and kill him, the victim complied with the suspect's demands. As the two drove northbound Azusa Avenue near the intersection of Paramount Street, the suspect exited the victim's vehicle and ran into the Shell Gas Station with the handgun where he was later arrested. The suspect, later positively identified as Andrew Edwards, was arrested and booked for the above mentioned violations. His bail was set at $100,000.00. The victim was not injured nor were any employees or customers inside of the gas station. This incident is is currently being investigated by the Azusa Police Department Detective Bureau .Anyone with information about this incident is encouraged to contact Detective Mario Corona at (626) 812-3200.